While I was at LUSH, I had a lovely associate help me pick out which products would be best for me. I explained that my skin gets a little oily throughout the day, but it didn't get overwhelming. She recommended I try Angels on Bare Skin, a soothing clay based cleanser with lavender and ground almonds for a mild exfoliant. It's supposed to be a nice introduction into LUSH cleansers. I really like the ground almonds, I love exfoliating but I've never found one I really like. I do on occasion have a breakout to deal with, and Herbalism will be great for those times I need to get cleared up. I haven't used this one yet, but I can't wait to try it! Another "introductory" kind of product. I didn't know which moisturizer would work best for me, so Imperialis was a good choice since it's good for most skin types. I'm loving this one so far, it feels fantastic and lasts all day! I've tried toners before, but the ones I've tried have been harsh alcohol based ones. The employee I talked to said it's great to use after you're out in the sun, and it's great to use in conjunction with Imperialis. I also got a small solid perfume in Orange Blossom that I'm really digging too! I'm not a perfume gal, really, but this one is subtle enough to wear every day! So there's my LUSH list! I'm really excited about this stuff, I think it's important to take care of my skin and I'm hoping that this routine will help. It's a bit pricier than I'm used to, but it's supposed to last quite a while, so it'll work out to be affordable. 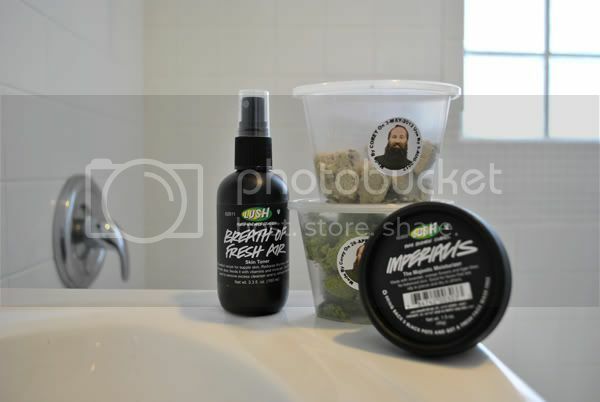 Have you tried any LUSH products? I'm interested to hear what you think of it! I've been using Lush for about 15 years and I have to say - I love it! They have something for everything - in particular, for my hair - I use Rehab and the fellow conditioner (I can't remember the name!) But Angel face is so good as a face mask and daily wash! I love getting new bath products. Even if it's just a new, different face wash or lotion. YOu feel so good :) I'll have to put LUSH on my wish list! I always find their scents overwhelming...these ones look earthy enough for me though! The body scrubs and bathbombs are awesome. I also like their hair stuff, like shampoos and whatnot. I love angels on bare skin. I've been a huge lush fan for well over 10 years. I'm popping I'm tomorrow to get a load of stuff for my mum for her birthday. 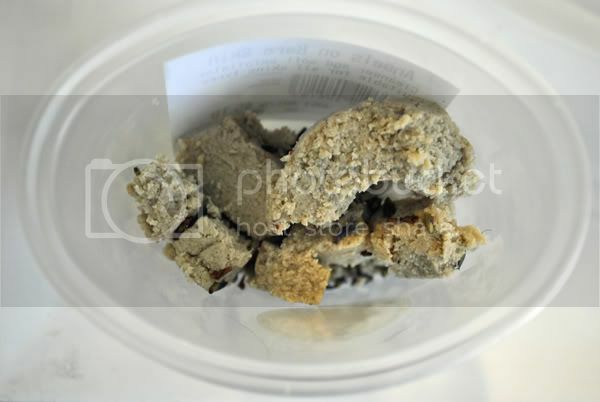 I love Lush too , you should try one of there fresh face masks they are so good. When I still worked at my old law firm that wasn't a health hazard, the attorney I worked for was a super hip younger one, and for Christmas she bought me a TON of stuff from Lush. I loved it. It was all bars of soap and such, no face things but I've always heard good things about their product. I wish there was one by me in Indiana! I love love lush, I've been addicted for years. The products you choose are great introductory products I use them all myself. Herbilisum isn't the best smell but it helps fight those pesky breakouts. If you ever want to try a face mask I love Cupcake it smells good and helps with breakouts as well, also oatafix it smells like banana bread and I am always tempted to eat it. Oh and wait till you try bubble bars you'll be hooked forever. i use angles on bare skin and a breath of fresh air every day and love them. my friend worked for Lush a few years ago and got me totally hooked, my skin loves it! 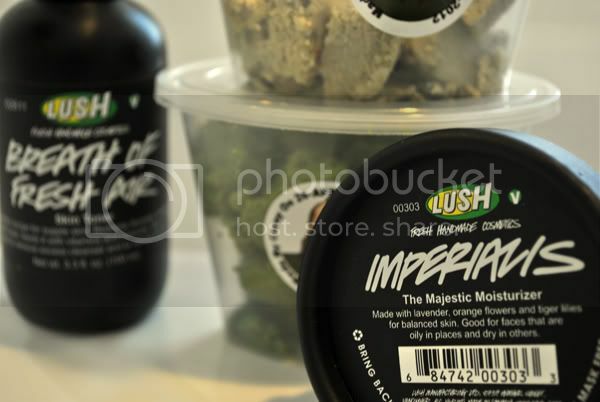 I love Lush, it's the greatest beauty brand there is in my humble opinion! The bath bombs, bubble bars & bath melts are definitely my favorite. It keep them in a little bowl in my bathroom and they are so decorative and smell amazing! My other favorite products are the Bubblegum lip scrub, (boyfriend is always complimenting how soft my lips are!) and R&B leave in conditioner. It smells AMAZING and leaves my coarse, dry hair silky smooth! Congrats, you're an addict now! I love, love, love LUSH. When ever I come up to Chicago I make of list of things I need to buy while I'm there. I use the Dark Angels scrub and it is perfect. I also use the Tea Tree Water. I really love Lush products! I adore their bath bombs, solid perfumes, and chapsticks. My best friend uses their masks and stuff, but I've yet to try them. I just love their stuff though. It smells so great! I've been a Lush fan for ages. I swear my luggage was half Lush products when I came back from London in 2003. Butterball bath bomb and Honey I Washed the Kids hand soap are my favorites. I used to work for LUSH.. in the factory with Corey- the guy on your fresh face cleanser. I used to make every thing from soaps, bathbombs, jellies... all of it really. I hope you enjoyed your LUSH stuff. Love Herbalism! Their solid serum is also a big hit with my face (been using it a year and a half now) best thing ever for the summer time. I also highly suggest you try out Dream Cream if you get the big time dry winter skin, I use it with both my boys (2 & 4 months) on their dry skin. Seriously how awesome is LUSH? I love that I can use it and my boys can use it as its more gently on their skin than traditional baby products. I hope you are loving the goodies you got. 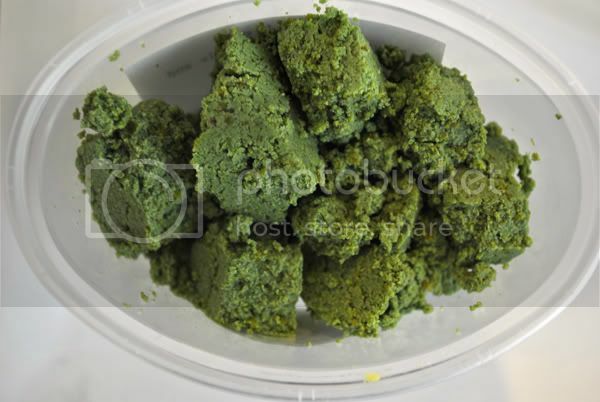 We use sooo much LUSH around our house as I love that everyone in our family can use it. Their bubble bars are my 2 year old's favorite, best and biggest long lasting bubbles EVER!!! 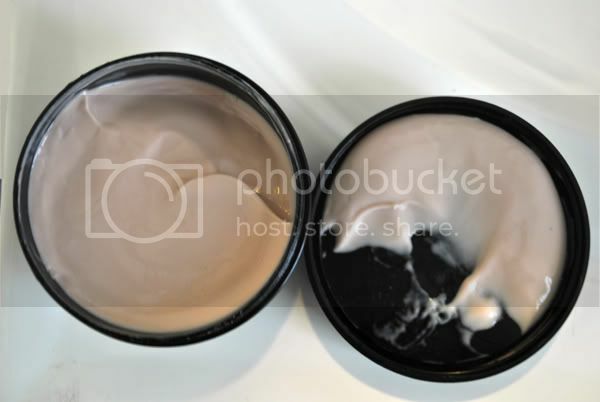 Now that its winter (in Washington at least) I suggest you try out Dream Cream or Charity Pot, I get Dream Cream for the kiddos and use Charity Pot generally for me, as well as Full of Grace (solid facial serum).